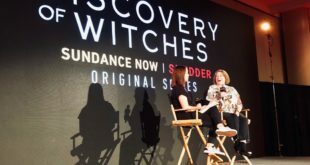 This past weekend Freeform’s mermaid-centric show Siren was at New York Comic Con and screened their first teaser for the series second season. 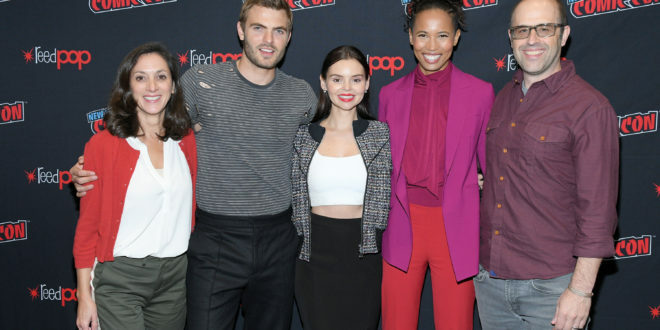 The Workprint got a chance to sit down with the cast (Fola Evans-Akingbola, Alex Roe, and Eline Powel) and creators (Emily Whitesell, Eric Wald) to find out what else we can expect when the series returns on January 24, 2019. As a quick refresher, season 1 of Siren ended with only one mermaid left on land and the big reveal that not only is Helen part mermaid, but she is also related to Ben. If you were worried that this mermaid show would be lacking in the mermaid department in its sophomore season you can let out a sigh of relief. Emily Whitesell: We’re gonna tell you some stuff because we want fans to be excited! You will see more mermaids come to land and there are also more other… well, Helen, for instance, is part mermaid and believed she was the only one on land so that may happen to. So we have a lot of exciting things going on. Alex Roe: Helen’s that person that has always been a believer and an outsider in a similar way to Ben but in her own way on another level. I think Ben has a lot of respect for her because of that and I think that as they need to work together in some way to figure out however whether these mermaids are gonna be dangerous, peaceful, why they’re here… that relationship and that mutual respect is gonna help them figure this stuff out and obviously her family connections and that will be explored too and what that means to Ben. Besides new mermaids, another new addition to Season 2 is Maddie’s mother (played by Garcelle Beauvais) and her arrival will have a huge impact on Maddie’s story arc throughout the season. Fola Evans-Akingbola: Maddie’s obviously left in very painful place with this fracture with Ben and the confusion about how she’s feeling about Ryn then her mom coming back becomes, for a little bit of time, a more pressing challenge. That’s not to say this doesn’t matter to her. It really does. She’d rather probably be spending her time with Ben and Ryn but her mom is a difficult presence in her life and is bad and that kinda distracts her a bit I think. Evans-Akingbola: We can’t tell you! We can’t confirm nor deny but I think they both enjoyed it. I think we can’t give it away but I think the definitely the throuple is explored more and that’s all we can say. Sorry, that’s so boring. I don’t know about you guys, but that answer screams a big ol’ “Yes” to the possibility of some more Ryn/Maddie action. One of the most interesting and fun tidbits, while not explicitly related the upcoming season, is that the show shoots their rescue center scenes at an actual marine rescue center in Vancouver, Canada. Not only that, but the show has actually kept the center afloat (pun intended). 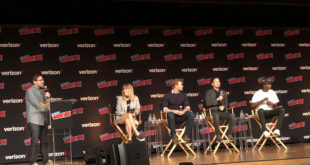 Whitesell: And we are so proud of the fact that that rescue center you see on the show, we are able to with some of our production money to keep that place going. It was about to shut down when we started the pilot and we were able to help them stay open and we are really proud of that. Watch the full interviews with the cast and creators below!